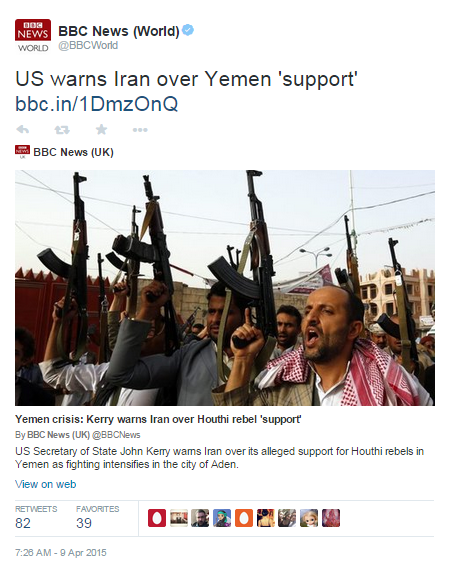 In recent weeks the BBC has produced two backgrounders concerning the ongoing war in Yemen. An article headlined “Yemen crisis: Who is fighting whom?” was promoted in the ‘Features’ section of the BBC News website’s Middle East page on October 14th and a week later – on October 21st – a filmed item titled “Yemen crisis: ‘The forgotten war’” also appeared on the same page, as well as on BBC television. “The conflict between the Houthis and the elected government is also seen as part of a regional power struggle between Shia-ruled Iran and Sunni-ruled Saudi Arabia. This is not the first time that audiences have seen the BBC’s apparent inability to inform its audiences whether or not the Houthis in Yemen are backed by Iran expressed in such vague and unhelpful language. A similar portrayal was found in a backgrounder titled “Yemen crisis: Who are the Houthis?” that was originally published in September 2014 and which was later replaced with an earlier version of this latest written backgrounder. In April 2015 BBC audiences saw further ambiguous portrayal in two articles and the following month they were told that the role of Iran in Yemen is ‘over-emphasised’. Both before and since the March 2015 escalation of the conflict in Yemen, numerous reports concerning Iranian support for the Houthis have emerged (see ‘related articles’ below). Reuters recently reported a rise in the supply of weapons from Iran. Three U.S. officials confirmed that assertion. “I mean, we’re aware that Iran provides lethal support to the Houthis. We have regularly and routinely called on regional actors to de-escalate the tensions in Yemen and the region, including abiding by the relevant UN Security Council resolutions, as well as the ceasefire, which both the – all parties have said they would support. Remarkably, after over eighteen months of reporting on the conflict in Yemen, the self-styled “standard-setter for international journalism” is still unable to meet its remit of building “global understanding” of this particular “international issue” by producing a backgrounder which tells its audiences whether or not Iran is involved in that war. We have commented here before on the BBC’s lack of journalistic curiosity regarding the extent of Iranian involvement in the conflict in Yemen. 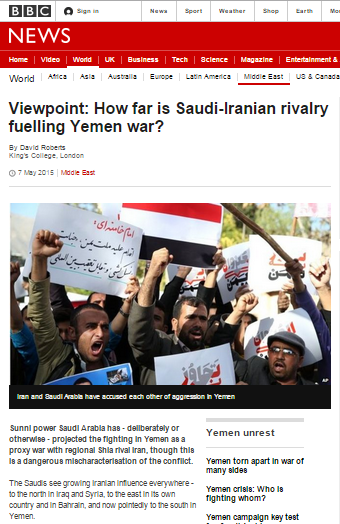 On May 7th the BBC News website’s Middle East page published an article in its ‘features’ section by Dr David Roberts of King’s College, London under the title “Viewpoint: How far is Saudi-Iranian rivalry fuelling Yemen war?“. As its opening paragraphs show, the aim of that article is clearly to lead BBC audiences towards the view that claims of Iranian involvement in Yemen are overstated. “Sunni power Saudi Arabia has – deliberately or otherwise – projected the fighting in Yemen as a proxy war with regional Shia rival Iran, though this is a dangerous mischaracterisation of the conflict. The same theme is continued throughout the article. Whilst the conflict in Yemen is undoubtedly rooted in domestic issues, this article does little to provide readers with objective and factual assessment of reports of Iranian involvement. Moreover, it completely ignores statements by Iranian officials including the one made by an Iranian parliamentarian after Houthi rebels took control of Yemen’s capital city. A report which appeared in the Financial Times on May 8th highlights an additional – although by no means unknown – aspect of the story. A Hizbollah commander, who withheld his name because members are not permitted to speak to media, said Houthis and Hizbollah trained together for the past 10 years. “They trained with us in Iran, then we trained them here and in Yemen. It remains difficult to see how the BBC can claim to fulfil its remit of providing its funding public and wider audiences with a fact-based “understanding of international issues” relating to aspects of the conflict in Yemen in particular, or the already under-reported issue of Iranian policy in the Middle East in general, if it continues to avoid any serious in-depth reporting on the topic. On April 9th the BBC reported on statements made by the US Secretary of State during an interview with an American media outlet. 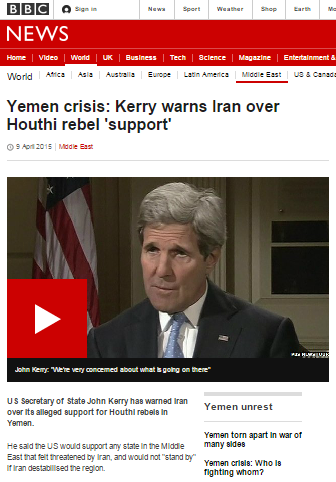 As readers can gather from the punctuation used in the headline “Yemen crisis: Kerry warns Iran over Houthi rebel ‘support’“, the BBC is obviously not convinced by John Kerry’s assertion of Iranian backing for the Houthi militia in Yemen and the language used in the body of the article itself was equally vague. The [Iranian] foreign ministry also summoned Saudi Arabia’s charge d’affaires in Tehran. The state news agency, Irna, quoted the ministry as saying the envoy would be asked to explain “baseless accusations” made by a spokesman for the coalition. On Wednesday night, Brig Gen Ahmed al-Assiri told a news conference that Iran had been training and equipping Houthi fighters, according to the Reuters news agency. Of course Iranian support for the Houthis is not a new topic: it one that has been under discussion for quite some time and in particular since the Yemeni coastguard intercepted an Iranian ship carrying arms destined for the Houthis over two years ago. A more recent statement from an Iranian politician appeared to add credence to the claims long made in the Saudi media and – as the BBC itself reported in 2013 – by some in Yemen. The BBC, however, has apparently opted to remain on the fence and appears to have little journalistic curiosity or interest in either confirming or refuting the assertions of the US administration and others with regard to Iranian activities in Yemen. It is difficult to see how the corporation intends to fulfil its remit of providing its funding public and wider audiences with a fact-based “understanding of international issues” relating to the conflict in Yemen in particular or the already under-reported issue of Iranian policy in the Middle East in general if it continues to make do with reporting based on the use of the word ‘alleged’. Viewers of the BBC World News programme ‘Impact‘ who recently watched a report by Safa al Ahmed (which also appeared on the BBC News website’s Middle East page on January 27th under the title “Yemen crisis: BBC gets rare access to Houthi rebels“) may have noticed a certain feature which cropped up repeatedly throughout the filmed footage. Seeing as no attempt was made to explain that logo in Safa Al Ahmed’s report, audiences might perhaps have turned to the BBC News website’s profile of the group titled “Yemen crisis: Who are the Houthis?“. 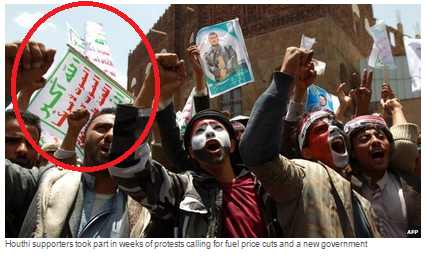 There they would have found that same logo appearing in a picture captioned “Houthi supporters took part in weeks of protests calling for fuel price cuts and a new government”. “It includes the words “Death to America, death to Israel, damnation to the Jews.” Houthis shout it when they march, wear it on arm patches, paint it on buildings and stick it onto their car windows. When pictured, those words are rendered in red, framed by “God is great” and “Victory to Islam” in green, on a white background. One might think that, given the BBC’s remit of building understanding of international issues, the corporation would consider that information worth communicating to its audiences, along with more comprehensive information on the Houthis’ alleged links to the Iranian regime (and Hizballah) than appear in its profile. Remarkably, the BBC does not appear to have much interest in conducting in-depth investigative reporting on that topic.